Talk To A Russian Lately? DEAR DIARY, I had to laugh when I saw the Democrats trying to nail Sessions for talking to the Russian ambassador. I knew the Jews would be jumping all over this, for just as they crucified Christ, they’d be calling for the blood of Jeff Sessions. Leading the pack to drag Sessions to Pilate, was the same hooked-nose Judas, this time, Chuckie Schumer. 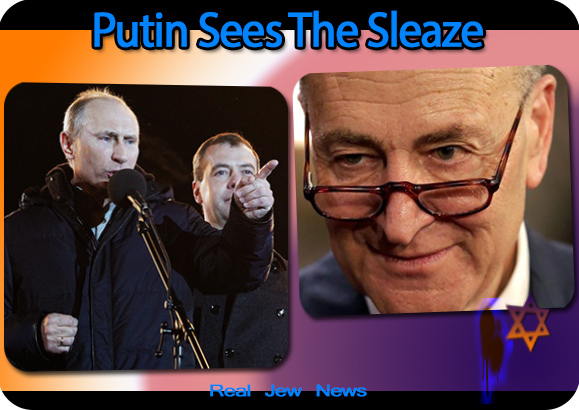 “I felt a knot in the pit of my stomach,” barfed Schumer, “when I read the revelations regarding Sessions’ contact with the Russian ambassador. I worried about the future of our country with foreign influence in our elections. It goes to the very wellspring of our democracy. Sessions should resign,” Schumer vomited. Never heard a peep out of Schumer when Netanyahu went to bat for Romney, slighting Obama, in the last election. “Knots in stomachs” only occur when a goy needs to be nailed. And what’s all this crying about assaults on the very wellspring of our democracy? Isn’t it obvious to anyone paying attention that “democracy” is awarded to the highest bidder? Money and Media decide who gets a shot at being elected to any political position. And who has the money? JEWS. Who owns the media? JEWS. My answer to them: Jews in the press do not “prostitute” themselves for their fellow Jews who own Capitol Hill. And assigning “corporate ownership” to the media is a journalistic cover for fear of the Jews. GETTING BACK TO TALKING to a Russian, well, I talk to Russians all the time. As a member of the Russian Orthodox Church, my conversations include both personal and political issues. I have to laugh when I see articles by Paul Craig Roberts or the Saker placing Putin and Medvedev in opposing camps: “Nationalists (Putin) versus “Atlanticists” (Medvedev)…BULL. Putin mentored Medvedev during his government service days in St Petersburg in the early 90’s. They’ve been in sync ever since. And both Roberts and Saker (faker) don’t have a clue when surmising that Putin is bamboozled by his desire to work with the US, restraining him from taking effective action against ISIS and other global concerns. LAST TIME I TALKED with a Russian, (a high ranking priest with the Russian Church), I was told that Putin knows who runs the show in Jewmerica, and with that knowledge, plays his cards close to his chest. Jewmerica—yes even Trump—wants a US military base there in order to fracture the Iran-Syria-Hezbollah “Axis of Resistance” against Zionist aggression. Yet, Putin is silent. Is he bamboozled? Ha, ha, ha. He’s plans on blocking it if necessary. But he ain’t telling Jewmerica. And so, dear diary, it’s good to talk to Russians, I talk to Russians all the time. The future belongs to them. While Jewmerica moves steadily downstream. If you want me to continue, please help! Bro N’s Street Evangelism Schedule, UPDATED! February 16-21: NYC / Success! February 21-25: Washington DC / Success! March 22-29 Washington, DC/AIPAC Conference! There is a phobia in the West in relation to Russia and Putin. To those who do watch the Jewish News Media, sometimes the stark reality is that the Media ties their journalist in knots of so many lies that thereby they are imprisoned in a manifest very long rope of deceit that amounts to a certain madness. In contrast to the western countries, Russia that is both Western and Eastern, shines against the ‘gross darkness’ that is in their many lands. The Bible says that ‘vain is the help of man’ so one does not look to the ‘man’, ‘Russia with Putin’. Maybe God in heaven will use that particular man to provide His Divine help in our world’s dire situation of entraptment by the Jews. The Christian world is a major part of their conquest because Christians should know their Bibles enough and should have a Pauline knowledge of the gospel to foil the darts of Judaism that have enmeshed its many millions. The Apostle was the first to take the Gospel of Christ, with signs and wonders, gifts of the Holy Ghost confirming it. He performed miracles and raised the dead as Jesus had said. He told them that because He went to the Father, they would do ‘greater things or miracles’ than He had done. The church leaders of Europe as I have read in their writings, pass off that certainty of promise as a watered down alternative. All the Apostles did those many more miracles, as ancient records and translations of manuscripts from the Syrian, Greek, Armenian, Macedonian, and Russian tell us. Andrew had been a disciple of John the Baptist and had heard how the latter called Jesus “the Lamb of God” [cf. John 1:36]. This was in fact the most important thing in His earthly ministry: neither preaching, nor miracles, but the sacrifice that He was to offer on the Cross, becoming the Lamb for the salvation of all of humanity. Andrew believed in this at once, for which reason we today call him the “first-called” – he was the first of the Apostles to be called. It was he who pointed out to Christ the boy with the five loaves and two fishes, which were later miraculously multiplied to feed the multitude [cf. John 6:8-9]. He, along with Phillip, brought several Hellenes to Christ [cf. John 12:20-22] (we do not know of any other such cases), but Scripture tells little about Andrew. We know him primarily through his acts and life. When the Apostles were sent forth to preach, they divided by lot the countries in which they would proclaim the Good News. Andrew received the coast of Pontus Euxine, that is, of the Black Sea. The southern coast (including the Crimean south coast) was part of the “civilized world” of the time, that is, of the Roman Empire, while barbarians called Scythians lived on the northern Black Sea coast. We do not know exactly how far north the Apostle Andrew went in his journeying, but a relatively late tradition has been passed down that he looked down upon the Dnieper River and blessed the place where Kiev was later to be founded; there is even a tradition that he reached the land of Novgorod and was astonished by the local inhabitants’ custom of taking steam baths! This is evidently an invention: the early sources say nothing about a northern voyage, no traces of this journey remain, and it is rather difficult to imagine such a voyage in the first century. Nonetheless, we can certainly say that the Apostle Andrew was the first to spread Christianity “in our direction.” It is quite likely that he did visit Chersonese, the future Sevastopol [in Ukraine]. There is another story that is also reliable: that the Apostle Andrew visited Byzantium, on which site the city of Constantinople was later built, founding a Christian community there and ordaining Stachys, an Apostle of the Seventy, to the episcopacy. St. Andrew’s life speaks of the many miraculous healings, and even of raising of the dead, that were accomplished in various cities through the prayers of the Apostle; it likewise speaks of the cruel persecutions he endured. After his voyage to the Black Sea, the Apostle traveled to Rome, the capital of the Empire, where his brother Peter was at the time. Emperor Nero was the ruler of Rome, and a time of persecution arose against the Christians, in which both brothers were later to perish. Andrew decided to return from Rome to where he had been before. Along the way he stopped in the city of Patras on the Greek Peloponnese, where he witnessed the persecution of Christians and spoke out in their defense before a Roman governor named Aegeates. For him, the most unacceptable Christian teaching was that of the crucified Savior, since this torturous and shameful execution was reserved for the most hardened of criminals from the very lowest strata of society. How could one worship a crucified Man? In reply, the Apostle set forth the story of the creation of the world and of the fall, of the Savior’s earthly life and of the meaning of His death on the Cross, calling upon him to join him in the Christian faith, that he might find his own soul. The Roman burst into laughter: “Do you mean that my soul has been lost?” From his perspective, only a fool could believe all this. In order to challenge the Apostle’s faith, he began to threaten him with death by crucifixion. The price of his preaching was indeed high, but the Apostle was prepared to pay it. A diagonal cross in the shape of the letter X (which is now called St. Andrew’s Cross) was chosen as the Apostle Andrew’s means of execution. To prolong his suffering, Aegeates ordered that, rather than being nailed to the cross, he be tied to it hand and foot. Russia can teach us all in the English speaking countries and in Germany, the Baltic States, and in Europe itself. We need to get back to the Gospel as preached by St. Andrew, regarded as a Saint, in the Russian Orthodox Church. There is a Canadian Journalist named James Corbett whom I suspect posts from Japan because he knows the Canadian media is now completely Mossad controlled. It’s dead in the water. He has some great videos about Jewish control although he calls it Bankers’ control. Its well worth googling the speculative “Hitler was a Rothschild” and “Who funded Hitler” by James Corbett. Corbett supports his arguments with evidence which he supplies. He is not a fake news service like CNN. I am inclined to believe Bro Nat is right when he says above that Putin knows exactly who is pulling the strings in America. The Russians are not stupid. During the Cold War they owned Western intelligence agencies through such people as Kim Philby, head of British intelligence, and they had all the code information the needed to destroy America in a nuclear war. The main thing the undisciplined Western intelligence agencies are good for, is creating fictional fodder for Hollywood movies like James Bond and so forth. Corbett’s main theme, which I agree with, is the Little People of the world are constantly being divided and made to fight one another while the real culprits, the mainly Jewish Bankers and their flunky shabbos goys, stay off the radar. Anyone recall the video of Chuck weeping a plastic tear over those poor (PAID OFF) Muslims he dragged with him in front of the camera; then Trump the next day holding back a laugh, saying how he saw Schumer’s FAKE TEARS, and this was while Chuck was being interviewed about the event… see his GRIN? LOL! Gads, that grin stretched from ear to ear, and his pinocchio nose grew ever longer as the grin got wider. The true mark of a Jew LIAR. Hah! Can ALWAYS tell when a Jew is lying… the unmistakable evil grin. We’ll be seeing a lot more of that stuff in the near future as the Dems keep trying to frame Trump’s team. But now with this wiretapping incident, I think tables are going to start turning, and even more people will dislike them for their lies. Trump says he’d prefer a two party system, but if this stuff keeps up, the Dems will be GONE soon. I pray God will minister unto Schumer and his ilk according to His righteousness and His justice as he sees they have need - that their end be in accordance with their works. A bit off topic BN but this I’m sure doesn’t come as a surprise to you. BUT their chutzpah is reaching new lows only proving you can shine *&^%. It is always nice to be reassured about Putin. I often hear people try to call him controlled by the Jews too- or even that he is racially mixing the Slavs to make them impure. Sometimes it is difficult to see any leader escape the grasp of Jewry. Then I hear liberals fearing a Russian invasion of Western Europe. Great! I would love them to free us from the kosher chains, take us away from Jewish materialism, and bring us back to God. Putin follows international law though, and would never do such a thing. I just hope he knows that many in Western Europe support Russia, hate the EUSSR, and Zionist US policy. We are so far from our ‘leaders’, we common man, that we are aggregously misrepresented. And even more silenced are we classical National Socialists. Let us hope that the rise of nationalism is genuine. Like Hungary. Magnificent Hungary. I dropped my daughter off at a friend’s house last night who’s daddy is an active US military man looking for retirement. He is an Air Force engineer. He told me that “we are building a base in Africa as we speak”. It occured to me that all the world has to do is sit tight . . . the JewSA will bankrupt itself and collapse under its own weight - leaving Israel in a not so desireable position in the world, with its big attack dog bleeding and gasping for air due to self-inflicted injuries. Of course, not before it makes another run or two at stealing another country’s wealth and slaughtering a few hundred thousand more civilians. Perhaps even more of its own. The ignorance and political correctness of this “idiot culture” is so complete it’s literally painful to see. When there was a Soviet Union, the Demonrats were all too happy to receive “Russian” influence within our system. Now that roles are reversed, we are more socialized than the USSR and Russia is more Christian than ourselves, those Demonrats are crying foul with their sturm und drang. The DNC should replace the donkey with the hippopotamus to better illustrate their being the “hippo-crites” they are. We have less than 22 months before the next midterm election. Let’s see who “survives” on the Demonrat side of things. American entry into World War II was supposedly precipitated, according to the Establishment version, by the Japanese attack on Pearl Harbor. Revisionists have established that Franklin D. Roosevelt and General Marshall knew of the impending Japanese attack and did nothing to warn the Pearl Harbor military authorities. The Establishment wanted war with Japan. Subsequently, the Establishment made certain that Congressional investigation of Pearl Harbor would fit the Roosevelt whitewash. “The complete facts will never be known. Most of the so-called investigations have been attempts to suppress, mislead, or confuse those who seek the truth. From the beginning to the end, facts and files have been withheld so as to reveal only those items of information which benefit the administration under investigation. I sometimes think that too much intellectualizing is not good. It’s not only not seeing the forest for the trees; it’s not seeing a tree for the tiny bugs on it. There are so many people that can dump tons of information and verbalization but don’t even understand the basic teachings of the Gospel and its prophecies. That amazes me. One reason Ernest Hemingway became such a popular writer is that he could say a lot in only a few words. I like Trump’s speeches because he doesn’t get too verbose. He holds my interest. He says a lot in a few words and many things Vladimir Putin says are simple and direct. Let’s keep it that way. In recent years the world’s stock exchanges have soared to unrealistic new heights. There have been occasional scares in the media about a Financial Reset over the last year or so. But mostly the Jews media is luring goyim into the stock market. Giving bad advice to goyim is one of the Protocols of Zion. As stock market textbooks explain - when market news is too good to be true and stocks go straight up, then sell your stocks because the bubble will pop. The Dow closed at 21,005 Friday. A crash seems imminent. The next market crash looks like it may be more severe than the crash of 1929 which triggered the Great Depression. From the great heights the world’s exchanges have reached, it’s a long hard fall. Whatever the JWO banksters have in mind, it looks like it will involve financial and economic chaos. Your comments regarding Hitler, the source being the Canadian journalist, Corbett, need correction. My husband is a Canadian and he also has had to recognize truth. I am sure you will. The story regarding Hitler that has been propagated world-wide, both before World War II, during it and afterwards is a continuation of gross infamy from the Jews and those English and American leaders who were all the way in with them. Sadly, the German people today believe the lies. I guess most of those contemporary with Hitler, knowing the truth of the politics of the time, passed on long ago. Yes, there is that fairy tale about his being a Rothschild. Well, that is a complete fabrication. What I present has been well researched and documented. Certain Jewish Foundations financed the official history of the War, that included Hitler. We were all taught the lies, newspapers spread them and books were written in the planned propaganda to which millions were targeted. The OSS and Donovan, as well as authors wrote books to deceive the widespread public. Hitler was not a Rothschild. There are many books available, even from the Revisionists, that unveil the truthful history they have discovered. We need to read their scholarly and honest presentations, for which many are persecuted, even as far as the four corners of the earth in Australia. I don’t think any of us have been prepared to learn what we do know, of the lies that abound everywhere due to Jews. Decent people cannot imagine so many millions either using or being used as a people, to almost completely blind eyes to truth in the matter. Christians cannot imagine there could be such people. They should, because the bible is not replete without the evil of mankind being shown to lurk everywhere at all times. There is an awakening continuing among a certain number of millions of ordinary people and many in places of authority and even those who rub shoulders with or have been friends of many in high places. Sadly, this stirring in the acquirement of the truth about the imposition of tyranny that has been placed upon the citizens of the world, has not been even a dint on the beliefs of Christians regarding Israel, The End Time myths, the Holocaust that did not happen and the ongoing Messianic Jewish falsities. Rather there is an increase in the madness of varying beliefs that have been fostered and foisted upon Christians by and through the Jews. Christians have had their spells cast upon them as Paul declared happened then by Judaists from Jerusalem who set out to ensnare the Galatians. The children of light they say they are, live in the darkness of deceit to which evil most have succumbed. They are not ‘wise as serpents or vipers, and harmless as doves’ that Jesus said they should be, in their union with those vipers presently engaged in their poisonous attacks upon them. The union is palpable in their choice of preachers, T.V. evangelists and books they read. They dare not curse. They must bless these ‘children of Abraham’ who are not his descendants at all. In any case the forbidden cursing does not appear to descend very far in that lineage through Jacob. Ignorance is evident in their eagerness to exalt Israel rather than the Savior who died for them and in their unwillingness to listen to anyone who shows them the truth in the Scriptures. Look at all of the visits to the ‘Holy’? Land and Jerusalem, the greater joy that fills them than any possibility of a journey to places to preach the Gospel. Oh, the waste in all of the millions/billions of dollars contributed by them to a covetous people, which is idolatry - and no idolaters will enter the kingdom of ‘God’, which kingdom these Christians have been deceitfully taught, is for the Jews in Israel. Find the truth or else your end could be not that you believe it will be. Only the Lord Himself has the answer to that. Onlookers find their thoughts and lips remain silent on that issue. The more of truth that all of us the better are we equipped to reach out a helping hand for the cause of right. There is an interesting YouTube Video called “Organized Crime Mafia” Episode 1. It’s interesting because the main individuals bringing down Italian organized crime in New York and Louisiana were Jews, including a Mr Cohn in Louisiana and, lo and behold, Alan Chertoff in New York. Chertoff is the guy who spirited the Mossad operatives, caught by the NYPD during 9/11, out of the USA. I belive he is a dual US/ Israeli citizen whose father was Mossad. Going on memory here. It kind of reminds me of the George Soros controlled “Panama Papers” where it appears rich Jews who controlled the illegal banking system made a calculated info dump to get rid of their goy boy competition by having Jew friendly MSM media (New York Times, CBC News, The Guardian in London) focus on very small potatoes financial criminals while rich Jews, like Soros, who has been convicted of insider trading, stayed right off the radar. It makes you wonder, did Mr Chertoff used his role as a NY Attorney General, and the American tax payer’s money, to bring down Italian organized crime in New York so that it could be replaced by Jewish organized crime? in other words did he use the taxpayers money to get rid of the competition in the name of justice? Br. Nat, I’m happy that your recent trips have been so successful. One question I do have is, have any of the people who listened to your preaching ever given you any money to help you continue your work? Now, to the Jeff Sessions conundrum. 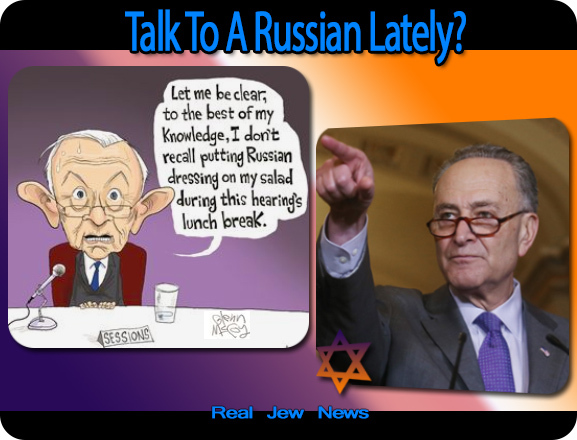 How idiotic can Chucky Schumer be to be calling for Sessions’ resignation, simply for doing his job as a member of the Armed Services Committee by talking with Russian Ambassador Sergei Kislyak? Schumer and his fellow Bolsheviks tore into Sessions as if he were doing something sinister, when it was they, themselves, who are being sinister. They did the same thing to Gen. Michael Flynn, forcing him to resign his position as Trump’s National Security Advisor. The Donald lost a great NSA advisor as a result of this witch hunt .. And, the entire scenario keeps reminding me of the Salem Witch Trials back in the 1690’s that simply careened out of control, and several innocents were hanged. The Demonrats are behaving the same way the Puritans in Salem, Massachusetts had done over 300 years ago. Gen. Flynn was the first “witch” to be “hanged”, and it looks like Sessions may be next. Trump’s big mistake regarding Flynn was his failure to defend him against the hysterical lies of his enemies. That’s the coward’s way out. Flynn was the best man for the job of NSA advisor and Trump knew it. The Demonrats have smelled blood and are now going after Sessions for the same idiotic reason of having spoken with Kislyak. No wonder Vladimir Putin’s wondering if the US has gone completely bonkers. I keep praying for you daily, that you’ll remain healthy and be able to continue the Lord’s work here in the US, both in your ministerial tours and your articles and videos. I had to pay an IT company tied to Microsoft in network security $400 for a year’s coverage after they cleaned up my computer of serious virus infections produced by a Trojan Horse, which set me back financially. My income is already limited, but I’ll do the best I can to help you out as well. The jew is uncomfortable in his own skin! Always they play games! And if they get caught - AND THEY WILL NOW - they just spin/squirm it into something else - playing games LIKE A CHILD OF THE DEVIL THEY ARE! Look who owns Sin City — Sheldon Adelson! They’re tortured souls inside and lash out in a teasing fashion to scratch their itch of psuedo control and struggle of their non-viability - hell is it any wonder why they’re ALWAYS self glorifying (Golden Globes/Oscars, etc)? It’s their way of worshipping the golden calf in public and being able to get away with it. SO MANY gullible fools out there nowadays! Them who have eyes let them see- them who have ears let them hear! jew worms HATE EVERYONE/ANYONE who are truly happy and secure . Is anyone allowed to ask about and question Israeli Jew influence on US politics? There is alot of disinfomation on the internet and just as much on MSM making it very time consuming to run everything down. I think most of it is done to make money but also ´much has been planted to confuse. Jews are simply obeying Jewish law. Jews obey the law. What’s wrong with that? Brother N, I’d love to hear your opinion of Jewish law! Getting hand injuries is no fun and I don’t envy anyone for the experience. Every time I see a video about the Crucifixion it makes me recall the injuries to my own hands. David Galea what exactly do you mean by Jewish law? Laws made by Jews or laws and judgments made by an extraterrestrial holy God who is by no means a Jew himself? Stop WWIII — the Obama Jew Nuclear War. America has gone from the most LOVED in the World to the most HATED in the World as a direct result of the WAR MONGERING JEWS. NWO war against Donald John Trump. The Jews were not kicked out of 160 plus nations during their history for nothing. The Jews want Putin and Trump out but it won”t happen. Trump will eventually declare martial law and control the Media. Guess who will come to his aid? Putin. It could be my pipe dream but look for internment camps to appear in the future. All wars are bankers wars - if you have done serious research. 666 is getting closer but I digress. Almighty Father in Jesus Almighty name we come before thy throne - everlasting. Almighty God in Jesus Name it is time you put a serious blow to the Druidic Counsel of 13 (the very top) and give them a crushing blow. OH LORD, you wait for men to pray who know you and accept totally in faith the perfect sacrifice of thine only SON Jesus Christ - for all mankind. Almighty God - Give the Druidic Council a crushing blow and remind them that you are GOD OF ALL! Yes Lord! And send Mighty Warrior Angels to protect Donald Trump. Yes Lord! Further, I ask - OH LORD JESUS - Warn them with disease and cancer. Visit them with sudden plague and heart attacks and pestilence by thine Almighty hand. Yes Lord I pray and may thine will be done. Remind them you are in control and even the demons tremble before thine presence. Some may trust in Chariots and some may trust in Horses but we will trust in the Name Of Our God. No King is delivered by the size of his Army. Foolish is the Man who trusts in the Arm of Flesh. Thank you Lord Jesus - I am able to approach thine Almighty Throne Everlasting in Jesus Name. Rise up Lord God and set forth righteousness and the rule of law in our Land for at least another generation. Please preserve America. America is controlled by Jews but they want to make the people believe that Russians control our government. Jews always project THEIR crimes onto others! I don’t think its a good idea to be cursing our enemies. We are supposed to love them. Don’t you think our opposition has taken steps to lay special curses on those who would try to block or nullify their curses. This is serious stuff. Don’t take it lightly. When we pray we ought to start out by putting on the whole armor of God. We are supposed to Love our enemies. 43 “You have heard that it was said, ‘Love your neighbor[i] and hate your enemy.’ 44 But I tell you, love your enemies and pray for those who persecute you, 45 that you may be children of your Father in heaven. He causes his sun to rise on the evil and the good, and sends rain on the righteous and the unrighteous. 46 If you love those who love you, what reward will you get? Are not even the tax collectors doing that? 47 And if you greet only your own people, what are you doing more than others? Do not even pagans do that? And pray for our leaders. 1 First of all, then, I urge that entreaties and prayers, petitions and thanksgivings, be made on behalf of all men, 2 for kings and all who are in authority, in order that we may lead a tranquil and quiet life in all godliness and dignity. 3 This is good and acceptable in the sight of God our Savior, 4 who desires [thelei, “will have”] all men [including those in authority] to be saved and to come to the knowledge of the truth. Obviously many of those leaders have turned to satanism and witchcraft, not because they are inherently evil, but because the Christians have not properly demonstrated the love of God and the character of Jesus to the world. By giving the wrong impression of Jesus’ character, these satanists have been deceived into thinking that he is evil and that “Lucifer” is a good god. So our prayers should be not to ask God to destroy them, but to open their eyes to the knowledge of the truth. The particular truth that Paul mentions in his letter to Timothy (above) is that God will have all men to be saved and to come to the knowledge of the truth. I’m an atheist so of course we don’t agree on everything. Whatever you think of me, I appreciate your bold, articulate, & entertaining insights, coming from one who’s seen it from the inside. I post some of Brother Nathanael statements on my local newspaper forum. And anything about Jewish or Holocaust issues gets removed! Nothing rude either. Censorship is happening at a local level in small towns. Where did I “curse” anybody. I did not. We wager not against flesh and blood but against powers and principalities against the forces of evil in the spiritual realm. a solemn utterance intended to invoke a supernatural power to inflict harm or punishment on someone or something. “Further, I ask - OH LORD JESUS - Warn them with disease and cancer. As far as I know powers, principalities and forces of evil in the spiritual realm can’t get disease, cancer, heart attacks and pestilence. Your definition, muzza.au, of a curse is correct as it is from the dictionary. However, Robert was not pronouncing a curse to be expected from ‘a supernatural power’. He was praying to the true God and Savior the Lord Jesus Christ. His was a request from the sincerity of his heart and not a curse, directed to his heavenly Lord. Whether that is what the Lord would desire is not the point here. The fact that we wrestle against evil powers in the supernatural realm does not intend for us to ignore the humans they control. 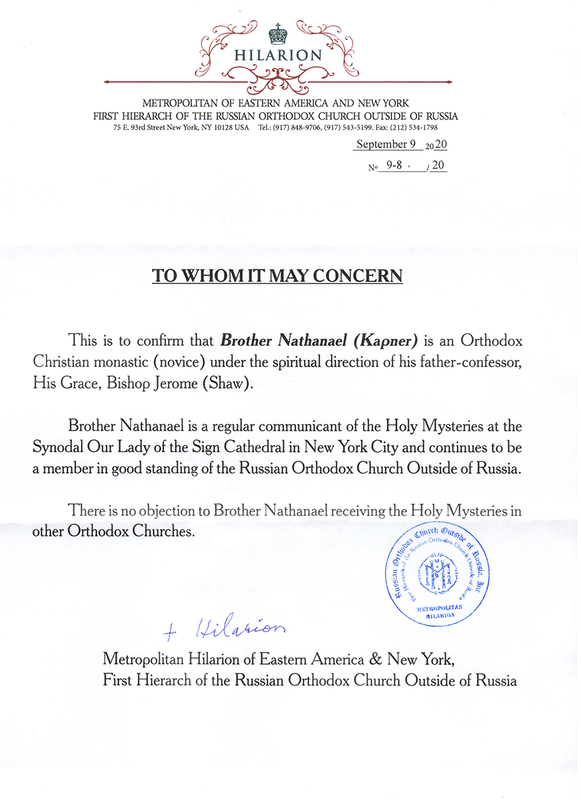 This we follow on this site, Brother Nathanael himself and most who comment. The people in Ephesus had a fight on against humans but at the base it was actually a spiritual wrestling. It is a force of demon-gods etc. under the dominion of Satan in the ‘heavenly places’. Today, it seems that all of those enemies up there are engaged in warring against in particular, Christians, as evidenced in the Middle East - in Palestine, Syria, Iraq, Egypt, Libya and even in Donesk (Russian territory). Humans are the ones used to do this. They are crucifying Christians and Muslims they deem heretics, cutting off their heads and removing whole ancient Christian communities. As well as plundering them of their land, homes and search for the required daily bread. Do we allow this or wrestle against it clad in the armor as cited by Paul? Are we to pray? Surely, yes and in the Spirit. Robert may have been in the Spirit when he did this. Who are we at a distance to judge? Our discernment must be based on the Scriptures and of course it is right to discern and judge but in this case we did not hear or see him praying. Thus it is right to pray and it is also in order to pass a discernment. Both should be in the Spirit. This is what we could ask ourselves.